Postcard celebrating the 1908 military rebellion by the Young Turks that restored the constitution of 1876. Among the revolutionary leaders were Enver Bey, later Enver Pasha, and Nyazi Bey. 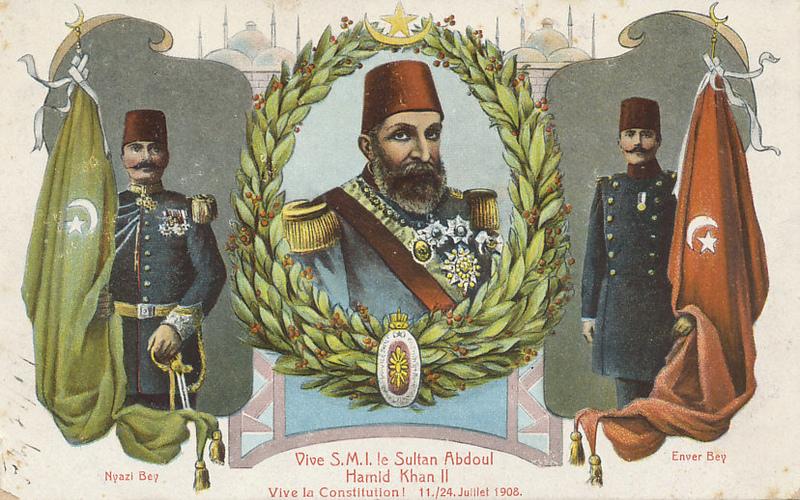 Sultan Abdul Hamid II was deposed in 1909, replaced by his brother Mohammed V.
Vive la Constitution! 11,/24 Juillet 1908. Long live the Constitution! 11/24 July 1908. The Young Turks seized power in 1908, restoring the Constitution of 1876, and limiting the power of Sultan Abdul Hamid II. The revolution began on July 24, 1908, and initially promised legal and electoral reforms. Armenians, Greeks, Jews, and other minorities were given greater rights and allowed to serve in the military. 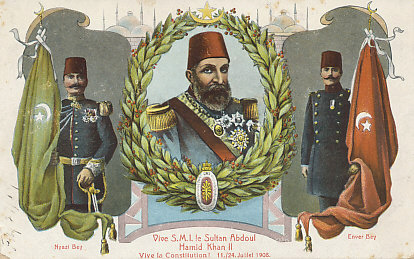 After attempting a counter-coup in which many supporters of the Young Turks were killed, Sultan Abdul Hamid II was deposed in 1909, replaced by his brother Mohammed V, who would become only a figurehead. Among the revolutionary leaders were Ismail Enver Bey, later Enver Pasha, a leader of the Committee of Union and Progress (C.U.P. ), the largest party in the new legislature. From 1909 to 1911, Enver was Ottoman Military Attaché to Berlin. The new government oversaw wars in which it lost swaths of the Ottoman Empire. In 1911, Italy defeated Turkey and took Libya and the Dodecanese Islands off Turkey's southwest coast. In the First Balkan War (October 8, 1912 to May 30, 1913) Greece, Bulgaria, Montenegro, and Serbia united against Turkey, defeating it, and shrinking its foothold in Europe. The Treaty of London ended the war and confirmed Turkey's losses as well as the independence Albania had declared on November 28, 1912. On January 26, 1913, the leaders of the C.U.P. seized power when Enver, Talaat, and 200 others murdered liberal War Minister Nazim Pasha and removed the Grand Vizier. On July 12, 1913 Enver led Turkey into the Second Balkan War against Bulgaria, regaining some of the territory the country had lost to Bulgaria in the first war. On the eve of World War I, War Minister Enver, Minister of the Interior Talaat, and Naval Minister Ahmed Djemal Pasha, the leadership of the C.U.P., effectively controlled the Turkish government.